Koovs Bags Online Sale: Buy and get upto 60% off on bags online at Koovs. Choose from backpacks, cases, pouches, clutches, designer handbags, purses, wallets, sling bags, travel & luggage bags, tote bags and more. Discount applicable for both old and new users. No coupon code required. The actual price is around Rs 1995 and you can get it for Rs 800. Shop from landing page products and place your orders now! Unlike perfumes, handbags are visible on the body. People don’t have to know you to judge you. And dresses and handbags are the windows for them. So declare your status or aspiration with the stylish Koovs handbags. Handbags are a part of women’s daily life. You have a different type of handbag for different occasion. Going to shopping, a big leather sack. A day out, you pull off a pretty sling bag. Visiting a nearby market, a colorful tote bag. Be it anywhere or any moment, Koovs got you covered with their variety of wallets, pouches, designer handbags, clutches, women bags and purses for all times. This Koovs bags sale offers you a huge 60% discount on all bags of the brand. Not only for women, there are also a wide variety of products for men too. You can choose from backpacks, cases, sling bags, travel, and luggage bags the brand offers. Known for their quality and stylish designs, these Koovs bags online are having a huge price cut now. For instance, if we look at the Hatte X Koovs clutch with camouflage print, it was priced at a whopping Rs 1995. Now, it comes with a new and smaller price tag of Rs 800. Made from faux leather and zipper fastening ability, this Koovs bag is a value for your money. 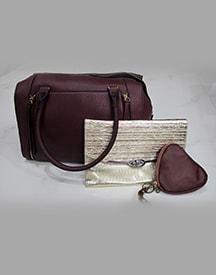 There are a lot more handbags and travel bags which are also at the same discount. HappySale brings you the list of products picked for you at their best price. Also, this offer is applicable for both old and new users. Go and grab the deal now by activating the offer which need no coupon code as such. Never be late in such deals, for opportunities knock but only once.